Today, it snowed. The wind blew and the air bit my face as if it were an angry animal. My garden now seems like a distant dream. 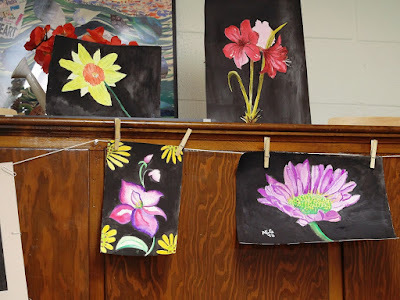 On Thursday, January 25th, at Stella Niagara, I started creating a little bit of a two-dimensional garden, with paints on paper. I started trying to create a world of color and warmth through art. Art and storytelling have the power to transport you to different worlds, through magical words and pictures. They also have the power to bring more color and light to this world, to the world of nature and of humans. They have the power to help you see in different ways. It was through learning how to draw pictures of human beings that I finally learned that people, including me, are not ugly. This time, my painting was not representing reality. I was depicting a flower in the winter. An image of a garden that, right now, is a mere dream. On Thursday, my project was a flower. Just one flower in a dark background. I started with a drawing on watercolor paper. 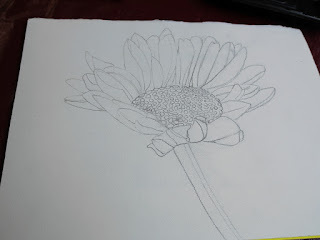 Virginia Kelley, the instructor of the class, asked us to bring an already completed drawing of a flower, as we would need the entire class time to painting the flower. 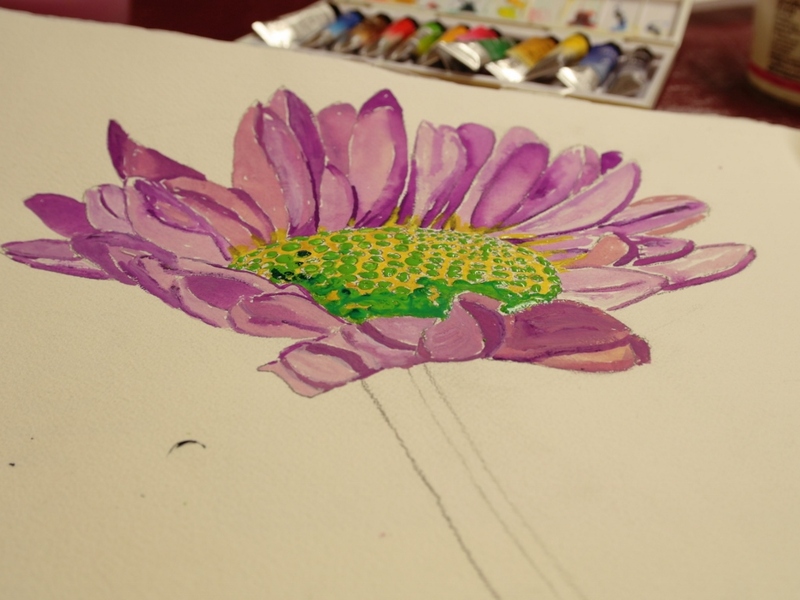 I began by painting the petals and then painted the center of the flower. 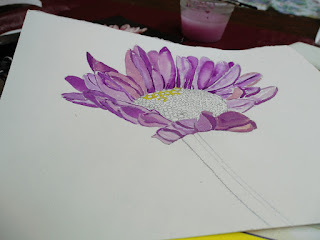 I used several colors to make the petals appear pinkish purple. The center of the flower was yellow and yellow-green. My next step was to paint the stem with a light green, a dark green, and a dark brown. The last step was to paint the background black. That proved to be the most difficult part of the process. As the black dried, it looked gray and the paint looked streaky. 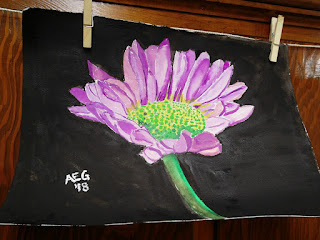 After I shifted paintbrushes for the second coat of black paint, I realized that part of the problem was that I was using a paintbrush that was too small. This Thursday, we continue making our dream garden with portraits of primroses. The story continues. I love the idea of bright colors against a stark background. I copied your drawing of a sunflower and will attempt to use watercolors on it. Idea: have you have painted the background first? Do you think the painting would work out if I tried to paint the background first? beautiful.. love that color you used on your flower.. I love photographing certain flowers (such as pink orchids) with a black background (I use, believe it or not, a shut off TV set). I never realized it would be that difficult with paint, because I have not painted in perhaps 50 years. And that was black velvet paint by number (dating myself). Loved your winter flower!